Other than a lousy manager, friction is the only thing that keeps a mine from operating at 100-percent efficiency. Excess friction can stop a mine in its tracks, literally and figuratively. Any industrial age industry or mining operation, as is the case here, had a location to store oil. Oil and grease were critical to daily operations, and for safety reasons, were usually stored in a separate building. The Oil House would have been a central collection point for these products and also a central depository for the disposal of them after their use. 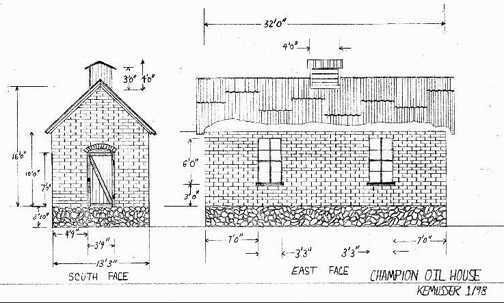 Mines are more than just the minerals, many support buildings needed supplying and add interest when incorporating a mine on your railroad. 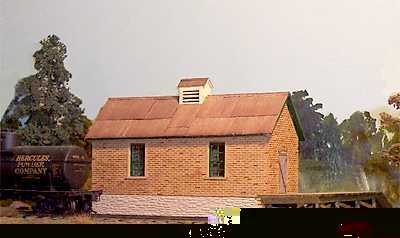 This type of building would have seen boxcars and oil tank cars on its siding to keep the mine in running order. At the Champion site the oil products were taken from this structure and delivered to where it was needed by wagon, later by truck. 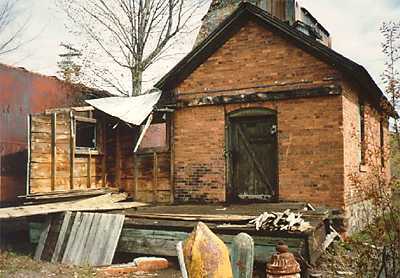 The Copper Range Company built the oil house at the Champion Mine in Painesdale between 1899 and 1902. It is located in front (east) of Champion #4 shaft-rockhouse. 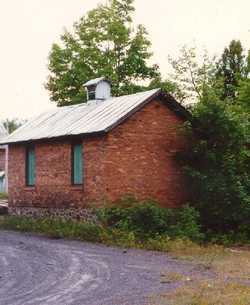 The main floor of the structure is of brick construction with a foundation constructed of poor mine rock. The foundation basement portion of this structure contains a large vat of used oil products and who knows what else. I am not sure how this material was extracted or if it was at all, as I don't know how deep it goes. The main floor was a warehouse for the storage of new materials. The structure had a loading platform that was covered later in life. Today this covered platform has all but returned to nature, as you can see in the photos of the prototype. The plans drawn here are shown without the covered loading platform as I feel the best feature of this structure is the door, which was obscured by the covered platform. I decided to model just an open platform with a ramp on the far side to offload materials to waiting wagons, I believe this is closer to what it looked like in the 1920s, before they got sick of shoveling snow off the platform. You can tailor your platform to your liking. In the photo of the model I have a temporary foundation, which will be changed out for a custom one once I finalize the location of this structure on my layout. As I have mentioned in previous articles on the Copper Range I use Heki-dur Random Stone #7011 for poor-rock foundations (the material shown in the model photo). The foundation is a perfect color right out of the bag but needs dark highlights on the stones to simulate the dark poor rock of the Keweenaw, not shown on the model photo. Note: Duplicate east face on west face, rear wall has no windows as shown in the prototype photo. My model starts with brick paper glued to basswood sheets to construct the walls. I airbrushed the brick with a mixture of Floquil Foundation and just enough Floquil Oxide Red to give a hint of red. I think this is a very good match to the base brick color of this structure. The bricks were then individually and randomly dry brushed with Floquil Rail Brown, Poly Scale Earth Red and Floquil SP Yellow. The windows and trim were painted Badger Southern Sylvan Green. The roof is made from Campbell metal siding and rusted with Rust-All. All in all it is a very simple structure and simple to construct but that is what you would expect from a building that shelters oil products from the elements and keeps them safe. The most important thing is the added variety of cars it will bring to and from your mine, which will help to increase the realism of the mine while taking up very little space.